Play Do you wanna build a snowman? Title: Do you wanna build a snowman? Description: Do you love the winter season? 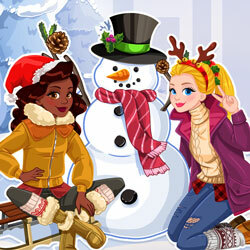 Join Audrey and Noelle in the yard and help them build a beautiful snowman. You can use different shapes to create a cute snowman, then you can decorate him and dress him up with funny clothes. Have fun!